GoToMyDevices has been migrated to RoomAlert.com. Learn more in our article, GoToMyDevices Is Now RoomAlert.com. 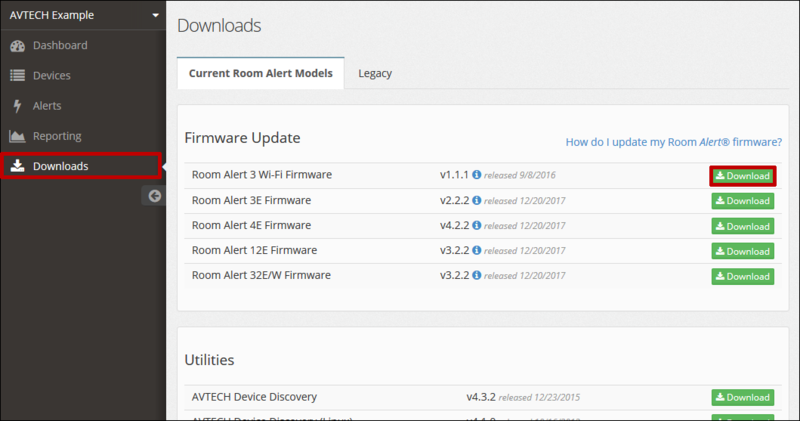 For access to downloads for your AVTECH products – including firmware, software and legacy SNMP MIB files – log in to your account at RoomAlert.com, AVTECH’s device monitoring and management service. 1. Log in to your account at RoomAlert.com. If you haven’t yet registered for an account, please see our FAQ, How To Register For A RoomAlert.com Account (VIDEO), for instructions. 2. In the navigation bar to the left, select Downloads. 3. On the Downloads page, locate your product, and select the green Download button next to it to start the download. a. If you see the Buy Product button next to the product, that means AVTECH does not have you listed as already owning it. You may select Buy Product to visit the product page on AVTECH’s web site. – However, if you see this button next to the Device ManageR software, you likely need to register one of your devices. This FAQ shows you how: How To Add Devices To Your RoomAlert.com Account (VIDEO). You must register at least one device in your Room Alert Account to have access to download this software. b. If you see the Upgrade button next to the Device ManageR software plugin bundles, that means you may upgrade your Room Alert Account to Professional or Enterprise in order to get access to download them. You may select Upgrade to upgrade your account. c. Firmware, MIB files, and documentation for legacy devices (Room Alert 26W, RA24E, 11E & 7E and TemPageR 4E & 3E) will appear in a Legacy tab in the Downloads page after you have registered your device(s). – Firmware updates for your Room Alert Monitor and TemPageR products are available here. – Once you download the firmware, use AVTECH’s Device Discovery utility or Device ManageR software to perform the update on your device. Please see our FAQ, How To Update Firmware On Room Alert Monitors, for instructions. – Device Discovery and Device ManageR are available on the Downloads page, as shown below. – AVTECH’s Device Discovery utility is available in this section. – You may use Device Discovery to discover and update your Room Alert Monitor and TemPageR devices. – AVTECH’s Device ManageR software and associated plugins are available here. – You may use this software to discover, update and monitor your Room Alert Monitor and TemPageR devices, as well as discover and monitor your Axis cameras. – You must register at least one of your devices to have access to this software. If you see the Buy Product button next to Device ManageR, register one of your devices and then return to the Downloads page. This FAQ shows you how to register your Room Alert: How To Add Devices To Your RoomAlert.com Account (VIDEO). – MIB files for legacy Room Alert Monitor and TemPageR products are available in this section. – Note that MIB files for current Room Alert Monitor models (listed below) are not available for download through your Room Alert Account. Rather, you may download the latest MIB files directly from the SNMP Settings page of your Room Alert Monitor’s web interface. – You may load them in any standard SNMP program to monitor your AVTECH devices. – Room Alert and TemPageR User Guides are available in this section.